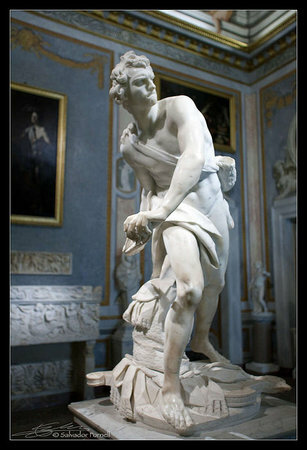 Bernini’s David is like a major league pitcher winding up to throw a 95 miles an hour fastball. The pitcher gathers all of his strength for each pitch and puts everything he has into it. Baroque art wants us to be able to relate to the image in our bodies, not just in our minds. Bernini’s David uses the space around it—reaching out into the space of the viewer. 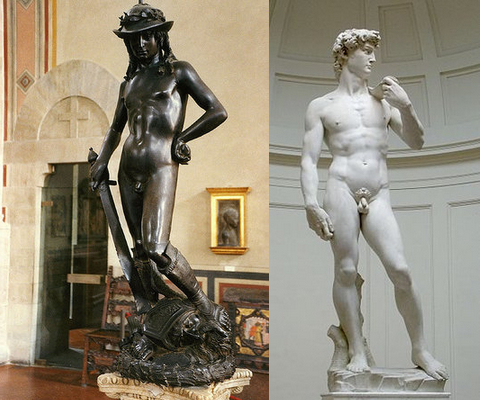 Bernini’s David is not content—the way Michelangelo’s David is—to remain separate from us. When looking at Bernini’s David, we immediately start to feel what David is feeling. This empathy is very important to Baroque art. In the High Renaissance we saw the composition in the form of a pyramid—a very stable shape. But in the Baroque era we see compositions in the shape of diagonal lines, as in Bernini’s David.The diagonal line immediately suggests movement and energy and drama—very different from the immobility of the pyramid shape. Donatello shows us an early moment in the Renaissance—the beginnings of Humanism when artists were first discovering contrapposto and the beauty of ancient Greek and Roman sculpture. His young figure of David symbolizes the Republic of Florence, which saw itself—like David—as blessed by God. Donatello shows David victorious standing on the head of Goliath. Michelangelo’s David is ideally beautiful. David contemplates his upcoming fight with Goliath, staring at his foe. While Bernini shows us a less ideal, and more real David—one who, with God’s help, is actively fighting Goliath (perhaps the way the church itself felt as they were battling against Luther). Michelangelo seems to be asking us to contemplate the incredible beauty of David, and through contemplating beauty (the beauty of man, God’s greatest creation), we come to know God. On the other hand, there is no time for contemplation with Bernini’s David, there is only time for ducking out of the way—our reaction is in our bodies, not in our minds. The path to God in the Baroque era is more direct, more emotional, more bodily, and that of course relates to the embattled position of the Church, which wanted to appeal directly to the faithful. Cite this page as: Dr. Beth Harris and Dr. Steven Zucker, "Gian Lorenzo Bernini, David," in Smarthistory, July 12, 2015, accessed April 20, 2019, https://smarthistory.org/bernini-david-2/.